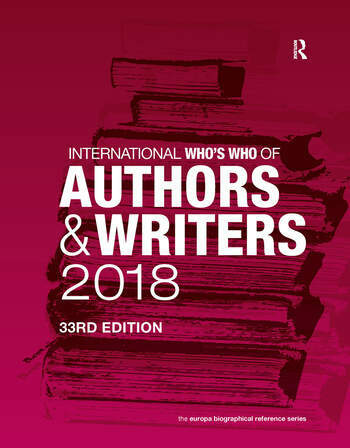 Now in its 33rd edition, this title is a comprehensive and practical source of biographical information on the key personalities and organizations of the literary world, whether world-famous or lesser known. This descriptive directory is revised annually by our editorial team and all entrants are given the opportunity to update their career details, publications and contact information. International in scope and covering all literary genres, this title will prove an invaluable acquisition for public and academic libraries, journalists, television and radio companies, PR companies, literary organizations and anyone needing up-to-date information in this field. Biographical details are listed for writers of all kinds, including novelists, playwrights, screenwriters, essayists, editors, columnists, journalists, as well as literary agents and publishers. Each entry provides personal information, career details, works published, literary awards and prizes, memberships and contact information, where available. - an additional directory section that includes current and detailed lists of major literary awards and prizes, literary organizations, literary festivals and national libraries from around the world. Part 1: Biographies Part 2: Directory Appendix A: Literary Awards and Prizes. Appendix B: Literary Organizations. Appendix C: Literary Festivals. Appendix D: National Libraries.